What have we learned so far about tech hubs in Africa and Asia? We were really interested to receive a report recently from GSMA on its work with hubs in Africa and Asia. The GSMA Ecosystem Accelerator Innovation Fund, which is funded by DfID, aims to build collaboration between start-ups and mobile operators, helping mobile operators to overcome challenges innovating in emerging markets, and helping start-ups overcome challenges which prevent them from scaling up their operations. GSMA’s research found that there are now 314 active tech hubs in Africa – a huge increase on the World Bank’s estimate of 120 hubs in 2015. Interestingly, 50% of these hubs are concentrated in five countries: South Africa, Kenya, Nigeria, Egypt and Morocco, although almost every African country has one or two hubs. 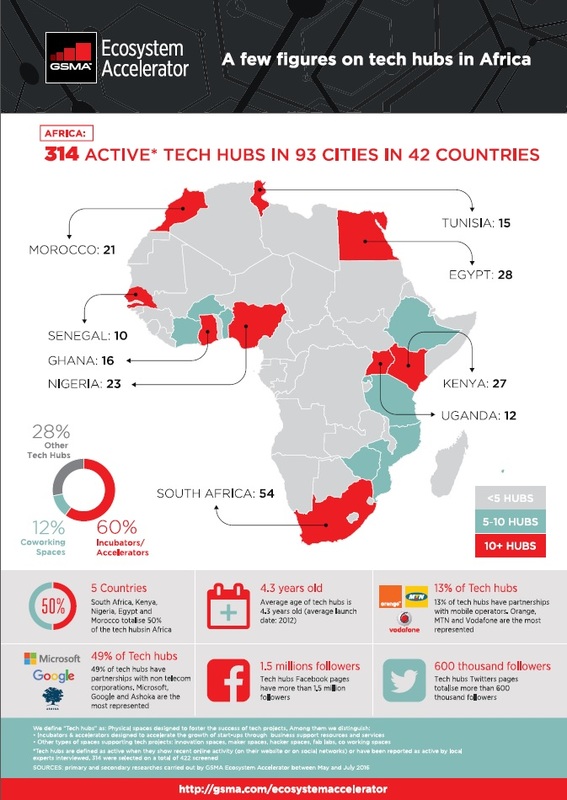 The full report gives a great overview of the state of tech hubs in Africa. You can read the full report here. Thanks to GSMA for sharing this valuable information with us.